Did you catch the exciting weekend stock car races? The Ford EcoBoost 400 NASCAR Sprint Cup Series has officially come to an end, with Jimmie Johnson emerging the winner after a fierce competition at the Homestead-Miami Speedway. 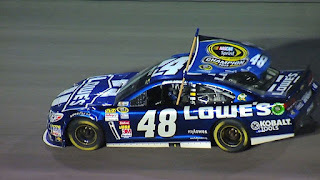 Johnson’s win is his seventh Sprint Cup Series championship, and he is now tied with illustrious names like the legendary Dale Earnhardt and Richard Petty for all time wins. The victory also marks Johnson’s fifth of the season, making him the most successful driver in the current season. At first, it seemed as if Johnson’s opponents Kyle Larson, Carl Edwards, and Kevin Harvick were going to hold him back from his huge victory. Larson ended up in second place after Johnson took the lead during the final race restart. Harvick managed to lead the competition for a whopping 79 laps but ultimately ended up in third place behind Johnson and Larson. Joey Logano and Jamie McMurray finished in fourth and fifth place, respectively.